Cover: Japanese decorative-stitch binding, with burgundy crochet thread. Forest green cotton fabric, spray-painted with cream latex enamel through a plastic light fixture grid and over-sprayed with peach 'carnival' webbing, covered boards, decorated with miniature silk flowers. Text paper: Paper sample books of multi-colors and weights by various paper manufacturers. Text page decoration: flower styles I created some years ago named 'Fantasy Flowers™', using Staedtler-Mars 3000 flexible markers, made by doing Oriental brush painting strokes and manipulation; others done with watercolors. 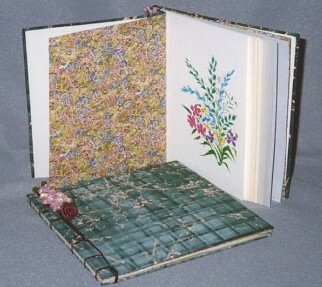 Book 5-5/8#34; x 5½" (14.4cm x 14cm).